21st and final stage on Sunday 26th July - The Tour is won by Contador in 85h 48' 35"
If you want to have more information about the Tour de France go to the Official Website. 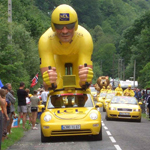 And to discover always more about the Tour de France 2009, visit our special page. It was again a beautiful race-Bravo, Vive Le Tour!